View pictures from this conference in the Photo Gallery. What we do is so important. What we do is so difficult. As my six-year-old nephew, Josh, bounded through the door, dropping his book bag before heading to the kitchen, I casually asked him how his day was at school. The reply, from behind the open refrigerator door, was not the customary, "Eh...ok," or even the standard "Same old stuff...," but rather a response that started simply, "We saw a show..." The fridge door closes. A pause. And then, "...It was about this frog!" Theatre has a way of reaching people in a way that even the most well designed exhibit or the most beautifully articulated textbook cannot. We can use it to open eyes and minds to everything from eggs to existentialism. We can be th edifference between an experience and a wasted opportunity. What we do is so important. 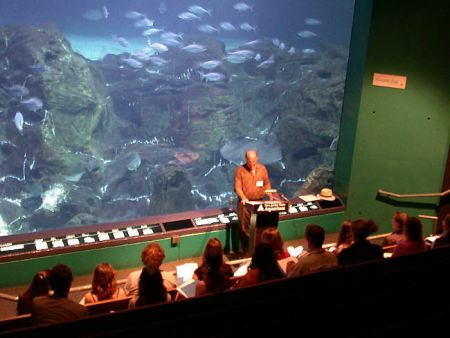 "I plan on creating shows that will rival 500 pound sharks and 14 foot stingrays as the highlight of the visitors' experience at the New Jersey State Aquarium." Big talk. The kind of talk you find on a cover letter for an application for the position of Artistic Director of a museum theatre troupe. My cover letter. It sure sounded good. To me, it almost sounded easy. Many successes and few non-successes (not failures, just non-successes) later, I can tell you, it is anyting but easy. Just getting one show off the ground involves dealing with more obstacles than I ever imagined. What we do is so difficult. Not what I do. Or what you do. But what we do. Sharing our successes and our non-successes can make all of our programs stronger. How things work for you may be just what someone else needs to know to make his or her program the highlight of a museum visit. And breaking it all down to the nuts and bolts of how we do what we do may start a lot more conversations with the phrase, "We saw a show..."
I look forward to meeting each one of you at the IMTAL Regional Conference.